Instead of the usual "View from Flagler County," let's get it from Blacksburg, Virginia, for a change this month, where operators there enjoyed a fine SKYWARN Recognition Day (SRD) celebration. SRD is an annual event sponsored by the ARRL and the National Weather Service, involving radio amateurs from across the country putting stations in their local National Weather Service Forecast Offices on the air to work other amateurs and participating NWS offices. Operators practice skills for sending and receiving simple weather reports to their local County Warning Areas (CWAs) using repeaters that have been set up for SKYWARN spotting and reporting. SRD is also just plain fun. Veteran SKYWARN operator Carter Craigie, N3AO, reported: "To start SRD off Saturday, December 5, at our Blacksburg, Virginia forecast office, it seemed appropriate that a snowstorm was blowing into the region -- our first weather reports consisted of "snowing" and "32 degrees." The Blacksburg operators used the SKYWARN radio station call sign WX4RNK. Carter Craigie, N3AO, in red shirt, and Rick Armstrong, KS4XO, operate WX4RNK at the Blacksburg, Virginia NWS Office on SKYWARN Recognition Day. (N3KN photo). Repeater Group. This system ran Echolink and IRLP, with Mike Knight, K4IJ, the group's guru, posting simple step-by-step instructions for ops new to those modes. The previous night, a VHF operation was run by Glen Sage, W4GHS, who checked in on one repeater to the next, soliciting weather reports. Sage was assisted by Bill Perkins, KJ4ASH, on 2-meters and 440 MHz as well as on 20 and 40 meters, and by Matthew Terry, KI4TYR, who also ran the rotation on 2-meters and 440 MHz. Dean Davison, KC2MTW, worked 440 MHz also. The 40-meter band offered good conditions and the band logs, provided by NWS Meteorologist and SKYWARN Supervisor Phil Hysell, KI4CKP, filled up rapidly as contact after contact was made, both locally and all over the continent. Meteorologist-in-Charge Dave Wert, KB2FZO, provided an excellent overview of the approaching snow storm, which was especially appreciated by SKYWARN Desk newcomer Ron Angert, N4AJT, giving him and the assembled crew many insights into work the forecasters do in order to accurately provide safety communications to the public. Angert went on to familiarize himself with the equipment at the SKYWARN Desk--another benefit to attending SKYWARN Recognition Day -- and then proceeded to make a few contacts. The HF operators kept the Kenwood TS-570D radio on the air from 9 AM Saturday until 5 PM. Craigie said they were pleased that the new loop antenna provided by SKYWARN Coordinator Phil Benchoff, N3PB, and Vic LaFon, W4VLL, worked so well. The HF crew took shifts starting with Craigie, who was relieved by Rick Armstrong, KS4XO, and ending with anchorman Roger Bell, N4FPA. Craigie said "we tried hard to surpass last year's effort and came close, but we'll have to wait for next year to break into the next higher NWS SRD category." NOAA sends out handsome certificates to their NWS Forecast Offices congratulating them for their effort. "Last year, the Blacksburg office won the Cumulonimbus Award; next year it will be at least the Lightning Award," said Craigie. March 29-April 2, 2010 at the Hilton Orlando, in Orlando, Florida. There is always a robust Amateur Radio and ARES presence at this important conference. Don't miss it. * Lessons learned from hurricane strikes. * State of the art programs worthy of emulation. * New ideas being tested or considered. * Information about new or ongoing assistance programs. * The ABCs of hurricane preparedness, response, recovery and mitigation -- in recognition of the fact that there is a continual turnover of emergency management leadership and staff. Look for a well-attended Amateur Radio seminar on the Tuesday of the meeting week, with participation by many Amateur Radio and hurricane response luminaries, and a good Q&A session. ARRL HQ usually sends a representative to discuss ARRL emergency planning and preparedness. The Hurricane Watch Net always has a presence. The 24th Annual Florida Governor's Hurricane Conference is slated for Fort Lauderdale, May 23 - 28, 2010. The 23rd Annual Governor's Hurricane Conference was a huge success, with over 2700 in attendance. Many of the 2009 presentations are posted on its Web site for viewing: Go to the Program page and click on Training Session or Workshop Descriptions to view. This is another conference that is well-attended by radio amateurs involved in supporting emergency management during tropical weather events, especially in the southeast and Gulf regions. The deadline to nominate an amateur or group of amateurs for the 2009 ARRL International Humanitarian Award is coming up fast -- December 31, 2009. This award is conferred upon an amateur or amateurs who demonstrate devotion to human welfare, peace and international understanding through Amateur Radio. The League established the annual prize to recognize Amateur Radio operators who have used ham radio to provide extraordinary service to others in times of crisis or disaster. The Programs and Services Committee, appointed by the League's President, recommends the award recipient(s) to the ARRL Board, which makes the final decision. The committee is now accepting nominations from Amateur Radio, governmental or other organizations that have benefited from extraordinary service rendered by an Amateur Radio operator or group. The ARRL International Humanitarian Award recognizes Amateur Radio's unique role in international communication and the assistance amateurs regularly provide to people in need. All nominations and supporting materials for the 2009 ARRL International Humanitarian Award must be submitted in writing in English to ARRL International Humanitarian Award, 225 Main St, Newington, CT 06111 USA. I strongly disagree with the popular consensus about government employees participating in radio drills. Did anybody listen to a single word uttered by the FCC's William Cross and Laura Smith at this year's Hamvention? The regulation is there to protect Amateur Radio from all those who would seek to steal our spectrum. Making this just about drills greatly oversimplifies things. Sure, nobody is "harmed" by a government employee participating in a radio drill. But where will it end? I don't think it will. Soon, paid employees of the Red Cross and Salvation Army will want their special dispensation, too. Who's next? Regarding the items on CPR training in the last issue, you are correct that the American Red Cross and the American Heart Association are both CPR training suppliers, but ARES operators should also check with their local hospitals for CPR courses, too. They might be less expensive than the other providers. But wait, there's more: Stonehearth Outdoor Learning Opportunities (SOLO) offers Wilderness Emergency Medical Courses ranging from basic to advanced levels, all oriented towards outdoor and remote activities. The National Outdoor Leadership School (NOLS) also teaches these courses, as does Wilderness First Aid (WFA), sponsored by the Wilderness Safety Council. The American Red Cross is upgrading their Wilderness First Aid Basics course and it will become Wilderness and Remote First Aid as of March 1, 2010. Your report in the last issue on the Red Cross training institute in Kentucky points out that the Red Cross is a rich source of training for ARES members. I urge ARES ops to contact their local chapters for information on classes that are being taught locally. However, potential attendees should go into Red Cross classes with appropriate expectations. These are, after all, Red Cross classes. They provide valuable information, but the emphasis is on material that is important for Red Cross volunteers. We've had issues with local hams who have attended Red Cross classes with the expectation of the material being ARES-related or communications-related and were disappointed with what they got. Each Red Cross class has a Fact Sheet that clearly describes the class. I encourage anyone who is considering attending a class to ask the local chapter for the Fact Sheet and review it carefully to be sure that the material in the class matches their need. Here's an example: You listed "Disaster Assessment Basics" in the newsletter. This is a three hour class that is intended to provide basic information for volunteers who are performing the task of evaluating the damage caused by a disaster. This task is extremely important since it sets the scope of a disaster, and it's critical to get it done as soon as possible by local volunteers. ARES often participates in the job by providing communications for the teams performing the assessment. If the ARES member wants to actually participate in the assessment, this course is vital. But if the ARES volunteer is insistent that their only task is providing communication, this course is going to seem a waste of time, although understanding the information that we're communicating makes us better at that job. We hams are, of course, well known for communications support of relief agencies in disaster and post-disaster situations. But we also provide a plethora of communication services on a "preventive medicine" basis to the public during special events such as marathons and bike-a-thons. For ARES operators, it is the experience and practice for disaster situations that make working "EvComms" so valuable. Work every one you can! The purpose of the ARRL'sSpecial Events Communications Manual is to give you tips and suggestions to assist you in planning your EvComms efforts. It's free and can be found by clicking on the link. With digital technology becoming an integral part of Amateur Radio, hams interested in emergency communications now have a new tool to help them take advantage of emerging modes such as Packet Radio APRS, Winlink 2000, IRLP, EchoLink and WIRES-II, D-STAR, APCO25, HF sound card modes and Automatic Link Establishment (ALE). The ARRL Digital Technology for Emergency Communications Course will introduce hams to all of the ways Amateur Radio operators are using digital technology as a valuable emergency communications tool. Written by ARRL Publications Manager and QST Editor Steve Ford, WB8IMY, this self-study CD-ROM will answer such questions as: Can you transfer supply lists or personnel assignments between emergency operations sites? Can you get critical e-mails to the Internet if a connection goes down? Can you relay digital images of damage at specific locations? Can you track the locations of emergency personnel and display them on computer maps? Illustrations, screenshots, Internet links and audio files are used to demonstrate transmission modes and equipment configurations. Bite-sized learning units and interactive knowledge checks make learning interesting and fun. "This course is a great starting point for anyone interested in the public service applications of digital communications technology," said Ford. Emergency power is often the critical link in any ARES operation. 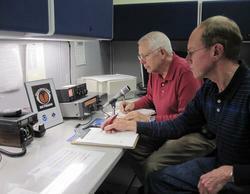 The following Q&As on this subject were harvested from an article written by ARRL Lab staff. Start by considering your power source. If a larger, sustained operation is indicated, consider a generator. Q. Our ARES group has a small 600-watt generator available. Will that be enough for four transceivers? A. Not if they're typical "100-watt" transceivers. That's only 400 watts, you say? Not exactly. You'll have to calculate the total power requirements for all equipment you intend to use, including the station lights and accessories. To determine how much generator power you need, start by making a list of the power consumption of your station equipment (which will be much more than its RF power output). If you're lucky, some of the equipment may have its power consumption listed in the owner's manual or on the enclosure. If only current consumption is provided, multiply the current in amps by 120 volts to determine the power consumption in watts. If there is no information available on the unit's power consumption, two rules of thumb may help: (1) A transmitter will usually operate at about 50% efficiency, so double the RF output to obtain the amount of power required. (2) The equipment fuse is usually rated at 150- to 200% of the actual current draw, so multiply the fuse value by 0.5 to 0.67 to calculate the approximate current consumption. Use one of these steps for all station equipment, including accessories and lighting. Now, determine how much of this equipment will be operated simultaneously -- perhaps four transceivers, two 100-watt lights, and several accessory items such as CW keyers, voice keyers, etc. If you are going to use the generator to power a piece of non-station equipment, such as a coffee pot, you'll need to include it as well. Some equipment may require more power than you have calculated, so adding a few hundred watts to your estimate is a good idea. Let's look at a typical calculation based on using only one HF transceiver: Transceiver 400 watts, Laptop computer 40 watts, Lamp 60 watts, and Soldering iron 100 watts, for a total of 600 watts. Some generators have a continuous power rating and an intermittent power rating. If you find that the total station requirement exceeds the available generator power, remember that transceivers draw full power only in transmit, and that they're not going to be in transmit 100% of the time. They could, however, all be in transmit simultaneously, so you need to make sure that the total possible power consumption doesn't exceed the intermittent power rating of the generator. Check the output voltage and frequency, if possible. If the generator doesn't have a built-in over-voltage protector, make sure the voltage is correct before you use the generator to power your equipment. Also, check the generator for radio noise. Some generators are not fully suppressed for ignition noise. You would rather find this out now than at the disaster site. If there is a problem, it may be possible to use resistor-type spark plugs or spark-plug wires. Check the owner's manual. You can also connect the generator to a good earth ground with a ground rod. Q. We won't have generator capability at our disaster site. How about battery use? A. Keep in mind that an automotive lead-acid battery was designed for one task -- to deliver a lot of current for a brief period of time. Its output voltage does not remain constant during its discharge cycle, and it is not a good idea to discharge it completely. An automobile battery won't tolerate too many deep-discharge cycles before it's ruined! A deep-discharge lead-acid battery is much better suited to your needs. It can be discharged repeatedly without damage, and will maintain full output voltage over much of its discharge cycle. You'll find this type of battery at automotive and marine parts supply outlets. They are not much more expensive than regular automobile batteries and are designed to deliver moderate current for long periods of time. Q. Is it possible to operate using batteries with a 100-watt transceiver? A. Yes, but you may find that a 100-watt station is a heavy drain on your battery. A car battery would probably last only a few hours--less if it's cold. (Cold batteries lose up to 70% of their capacity.) A deep-cycle battery has a typical capacity of 1000 watt-hours, but you may not be able to use all of this capacity with a transmitter or receiver: As the battery discharges, its output voltage drops. When it drops below 12 volts or so, most amateur equipment will not function properly. Q. Well, I can recharge the battery, right? A. Yes, from commercial mains or a gasoline-powered generator. Alternative sources of charging power, such as solar panels or wind-driven generators, can be used. Q. Solar power sounds interesting. Is a solar panel difficult to use? A. No. Solar panels have only two wires to connect to your battery or circuit - one positive, one negative. Some solar panels have a diode in series for polarity protection and to reduce current flow from the battery back through the solar panel. This is no longer the case with many modern panels, particularly the larger ones where efficiency is important. Tests have shown the diode causes more energy loss during the day than the very small wattage dissipated in the solar panel at night. Solar panels typically deliver 15 to 18 volts at 600 to 1500 mA in full sunlight. This will not damage a high-capacity battery, such as a deep-cycle unit. All you need do is hook up the battery, put the solar panel in full sunlight, and charge away. The battery will regulate the maximum voltage from the panel. If you're going to use a solar panel to recharge a smaller battery, such as a Nickel-Cadmium (NiCd) battery or gelled-electrolyte lead-acid battery, you'll need to pay a bit more attention to detail. These types of batteries can suffer damage if charged too quickly, so a regulated charge is necessary. The ARRL Handbook has several solar-panel charging and regulator circuits. Q. A large lead-acid battery sounds a bit heavy. Are there any other types of batteries that we can use? A. It depends on how long you want to operate. If you're planning only a few hours of low-power operation, you might be able to get away with using dry cells, either standard carbon-zinc or alkaline. (Don't forget that a carbon-zinc or alkaline battery should not be recharged!) An alkaline cell can deliver quite a bit of current and will last a surprisingly long period of time. NiCd batteries are usually not suitable for sustained operation above a few watts, but if you are planning to recharge them from solar power, they may be good for quite a few hours. If you do use NiCd batteries, do not allow them to become fully discharged. This can cause permanent damage. Medium capacity lead-acid batteries are made with a gelled electrolyte. These are commonly called gel cells. In most cases, they are completely sealed and can be operated in any position. They are available in a variety of sizes, ranging from 1 Ah to about 50 Ah. (A list of suppliers is found at the end of Chapter 35 of the ARRL Handbook, or go to http://www.arrl.org/tis/tisfind.html and search the keyword BATTERY). Gel cells are a good compromise between portability, capacity and ease of use. They must be charged properly, though. If you charge them too fast, bubbles can develop in the electrolyte, permanently damaging the battery. They should be charged at no more that about 10% of their output rating in ampere-hours. Q. Someone told me that there is a device that will convert 12 volts from a battery to 120 volts ac. Why can't I use one of these? Q. Does the ARRL have any information about emergency power? Powerpoles are now available in welded assemblies from Anderson Power Products. There is typically a minimum of 500 to 1000 pieces (250 to 500) mated sets. These are ultrasonically bonded. Because Red and Black are so popular, there is a standard part number: PPHSG12RB. These cost a little more because of the extra labor to bond them, but now you can do away with the roll-pin. You can order this from any of our distributors. See our Web site for our regular distribution channels.There are also numerous smaller distributors that carry some product as well. The 20th World Conference on Disaster Management (WCDM) is scheduled for June 20 - 23, 2010, in Toronto, Canada. The theme is "20 Years of Progress." Industry experts will discuss the progress of past, present and future trends. This four day conference will offer new ideas and approaches that will help build solutions for a global community. Click for more info. According to its Web site, "The World Conference on Disaster Management (WCDM) offers a unique experience, bringing together experts, practitioners, certifying bodies, service and product suppliers from Emergency Management, Business Continuity and other Disaster Management disciplines. Notable of the Month: If you Google "Emergency Communications," five of the first ten results reference Amateur Radio. Are you thinking what I'm thinking? Amateur Radio is a key emcomm asset in this country.